As someone who's been jaded about social media for social change, I've never been more hopeful that a connected web changes the game for how we can spark our communities for real world action. When it comes to the climate crisis, We are wiring a safe & sane climate future -- how we use the web is helping to raise unheard voices and bring a global movement together for change. Maybe you've heard these catch phrases before -- well, it's happening. On Oct 24th, over 5,200 events took place in 181 countries calling for one number: 350 (the safe amount of carbon in the atmosphere). A lot of real world organizing was involved -- but there's no way this would have been possible without a .org attached to the most important number on earth. Yesterday, the first ever hashtag made it into the center of the UN climate negotiations, #WeStandwithTuvalu (a Pacific island nation) -- an action that was coordinated by SMS inside the conference in Copenhagen. The 350.org Facebook community has thrown their weight behind the Maldives President by leaving comments on his Facebook page. This wasn't just an online petition, it was a new form of solidarity. Last week, a young climate leader inspired real people to light real candles of hope through a YouTube video. Collaboration? Avaaz.org and 350.org have pooled together their action maps -- which is also embedded on the TckTckTck coalition's website. On Oct 24th, the action sign up page was embedded on Greenpeace's website. Social media empowers a movement to better sing together. Every day, I'm blown away more by what we're just beginning to get a handle on. Right now where we are in history is something big. 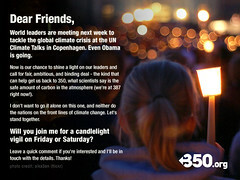 Next week most world leaders are coming together to take on the climate crisis in Copenhagen, Denmark. In all likelihood, they won't save the ship. We can't just retweet the news, though. As guardians of the web for change, this is our chance to re-mix our networks for hope. Will you spread this Facebook postcard by clicking here -- and then click "Share." Let's show world leaders that history has changed -- that a wired world means one that is more educated, connected, and actionable. Then maybe we can change the future. Many thanks for being the leaders of the connected web/world. I'll #FollowFriday you anyday.